Just the gift for someone who loves to entertain! 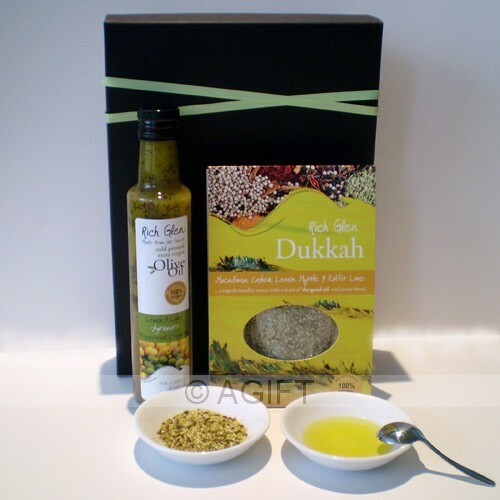 Simply add a selection of crusty breads and olive oil, to dip into the dukkah. A quick and easy savoury delight for guests. Alternatively rub oil into lamb or chicken and coat with dukkah for a delicious roast or BBQ. Complete your BBQ with a fresh green garden salad dressed in Lemon and Lime Agrumato Poppy Seed. An easy to prepare delight for guests. Presented in a stunning black gift box with complimentary ribbon wrap. A gift hamper for him or her. Rich Glen Estate is a family owned and operated Australian business situated on the banks of the Murray River in Yarrawonga, Victoria.